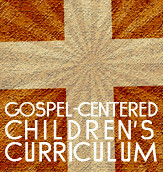 Another strength of gospel-centered curriculum is that the gospel aims at the heart while moral “how to” lessons aim at the surface of behavior. If Martin Luther, John Calvin and the Reformers understood Jesus correctly, all sin ultimately is an issue of worshiping something or someone other than God in Christ. John Calvin said, “The human heart is a factory of idols…Everyone of us is, from his mother’s womb, expert in inventing idols.”1 This is the WHY behind our sinning. Martin Luther believed that any sin rooted in the inordinate lust for something which comes because we are trusting in that thing rather than in Christ for our righteousness or salvation. Therefore, in sin we are always “forgetting” what God has done for us in Christ and are instead being moved by some idol.2 In other words, we sin because we have forgotten the gospel! We cannot simply tell children (or adults for that matter) to simply stop worshipping whatever idol to which their heart is given. The idol is too powerful. To remove it we must replace it with something greater. We need the expulsive power of a new affection. The gospel, not mere moral exhortations, is that power. Not taking children to the gospel but only teaching “how to’s” each Sunday is like trying to stir something deep but only having a small stick to work at your disposal. While on the surface you may have a lot of action, deep down there is little to no change at all. In the end, “how to’s” only affect the behavior of a child for a brief time. Maybe the “changes” last only a few days if not evaporate by the time the child leaves the church campus. But when you exhort boys and girls to continue to trust and abide in the gospel, you are dealing with their heart. You are using the only instrument that really dislodges the sins of the heart – sins beneath the sins. Sins that behavioral change can never reach. 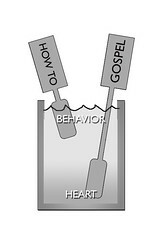 Again, “how to’s” only affect the surface while the gospel affects the heart. As kids progress through each grade, more and more find themselves with smaller hearts for Jesus and a growing dissatisfaction with the church that gives them those rules. Should we be surprised that in America, most student ministries have active, engaged senior classes that you could fit in a thimble. The bleak picture is, without gospel-centered age-graded ministries, students will graduate not only from high school but from church as well. That’s what people with small hearts for Jesus do. They see Christianity as something you, for all intents and purposes, “graduate” from. But with gospel-centered curriculum in gospel-centered ministries there should be a different hope and expectation. Is this iron-clad? Obviously not. But I would argue that churches have a better shot at reaching this type of trajectory for our students if each Sunday we would help them see the glory and greatness of the gospel! John Calvin, Institutes of the Christian Religion, 1.11.8, 108. Adapted from Tim Keller, Preaching the Gospel in a Post-Modern World, 66. Martin Luther, Treatise Concerning Good Works, IX. Thomas Chalmers, “Discourse 9”, Vol. 6 Discourses on the Application of Christianity to the Commercial and Ordinary Affairs of Life.